A SSIF member is presenting her findings to the group. Buy low, or sell high? No one will confuse the campus of Southern Illinois University Carbondale with Wall Street, home of the New York Stock Exchange and the world’s largest stock market. But Rehn Hall, home to hundreds of College of Business (CoB) students, has been the site of successful investments in the stock market over the last 15 years, all thanks to the establishment of the Saluki Student Investment Fund (SSIF). This year marks the 15th anniversary of the student investment group that is run under the umbrella of the CoB finance department. Not much has changed since June 2000, when SIU alumni Omar Winter (1957, Management) and Carol Winter (1958, Elementary Education) initiated the launch of the student organization with a donation of $25,000 to the College of Business. Shortly thereafter, the SIU Foundation provided an additional $200,000 for the students to manage on its behalf. 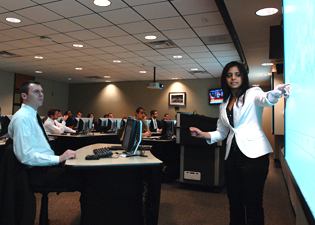 The SSIF, which operates like a real investment management firm, provides SIU undergraduate students with hands-on experience in portfolio management and investment research. Students get an opportunity to buy and sell stocks, which SIU finance graduate Jeremy Bliss called a nice supplement to his coursework. Nevertheless, the student-led fund has proved to be an effective teaching tool for the 33 participants that are primarily CoB students – and a profitable one, too. Based on this outstanding performance, the SIU Foundation invested another $650,000 in 2011 to bring the fund up to $1 million, and its assets have since grown to $1.56 million. Of that total, about $1.47 million is managed on behalf of the SIU Foundation, the SSIF’s primary client. The rest is managed as part of the COBA portfolio, which has grown from the Winters’ original donation. The biggest point of pride for the students is the return on investment. The fund is divided into various market sectors, and the 33 students who operate it have to make careful buy-and-sell decisions. To support their recommendations, the students conduct research and analysis using some of the same tools as large investment firms on Wall Street, such as Bloomberg Professional, which is available to students at all times in the Kraft Trading Floor in Rehn Hall. “This experience is very similar to what you would find in the real investment world,” said Rachel Crofts, a recent graduate of accounting and finance. The only difference is that the students neither get paid nor receive any course credit for the 10 hours a week of research and analysis they may invest for the fund. But that doesn’t seem to lessen their commitment. In return for their hard work, the students get to participate in the stock market versus merely watching it on television. At the same time, they also have the opportunity to invest in their own futures and greatly enhance their résumés. That’s just one part of the SSIF’s success story, too. In 2001, its second year of existence, the student-led investment group participated in a national competition for college investment groups that took place at the University of Dayton. The Salukis, competing for the first time, came away as one of five finalists in its category that comprised 12 universities. The SIU Foundation Investment Committee of the SIU Foundation Board provides oversight of the Saluki Student Investment Fund. The SSIF is open to all students at Southern Illinois University Carbondale. For more information about joining SSIF or the Graduate Student Investment Fund, contact faculty advisor Xiaoxin Beardsley at xwang@business.siu.edu.